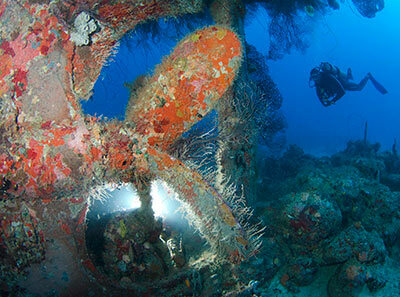 Grenada’s Scuba Diving is famous for its outstanding coral reefs and marine life but Grenada is also the No.1 spot in the Caribbean for wreck diving. As recently as 2007, three more ships were sunk to form artificial reefs, bringing the total number of sunken ships in our waters to an incredible twelve wreck sites. They vary in depth from 10 to 50m, so we have something for the novice as well as for the more experienced diver. Our Grenada ship wrecks are in great condition, supporting an abundance of marine life and offering stunning photo opportunities. Our most famous wreck, the Bianca C, is known as the Titanic of the Caribbean this 600ft cruise ship sank in 1961 and offers a truly breathtaking dive. 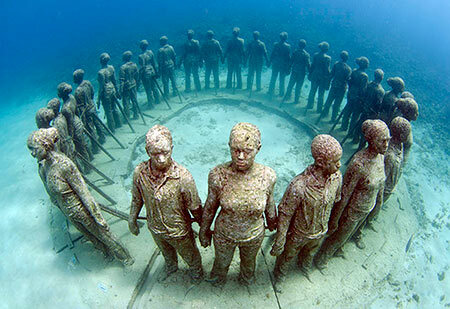 One of our most unique diver attractions is Grenada’s Underwater Sculpture Park. This is located in our Marine Protected Area and depicts Grenada’s rich history and folklore. ” English Sculptor Jason Taylor sourced all his materials locally to produce these works of art and has achieved worldwide acclaim for these very diverse creations. Come and see for yourself. National Geographic named it as one of ‘Earth’s most awesome places’……we would not disagree with them! Grenada is an all year dive and snorkel destination that boasts an average water temperature of 28 deg. C. Our diving partner is ‘Dive Grenada’ a PADI 5 Star and BSAC Resort that offers Kalinago (Gem) Resort clients a 10% discount off their diving, they are located 5 minutes away and offer our guests complimentary pick up and return.